JUNE 2007 -- As I think about June, the month when things “come busting out all over” and what I can do to enhance the spiritual growth of the readers of this publication, I think about the rapid changes we have in our society from the time when Oliver Hudson Kelley set up the Grange with a ritualistic foundation but intended to get people together to “advance their interests, elevate their character and increase the influence” of the members. As I see his idea was that productive people would gain in wealth and spirit to make a better world for all. Following in our founder’s foot steps, I see my task as giving information to help you to be a productive person in an extremely fast changing world. I suggest you come to understanding computers, email and the internet as very helpful in today’s world. (I’m writing this on a computer now and will send it to the Editor by email and it may even appear on the internet some day.) The fast changing world also means that people are interested in organizations that are doing things in their community so the successful Grange needs to be active in a community to attract new members. 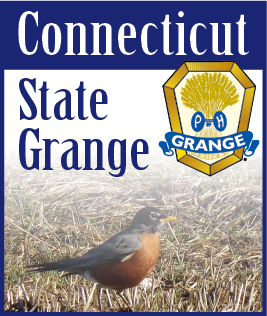 There is a chance to remove yourself from the humdrum of the being productive in your daily activity by taking advantage of the tremendous resource the Grange has at the Big-E where Grange members can find out about the many activities in the agricultural world and invest half their time on the grounds at the New England Grange Building educating the public about the Grange, demonstrating a craft or helping to sell the crafts, jams and jellies for sale without paying the Big-E entry fee. These are just a few approaches to help you grow in today’s world. Know that God loves you and has given you talents which if cultivated can bring great joy and that the things you like to do are part of the successful life which helps you grow in our fast changing world of today. I pray that you can bust out of any humdrum world you are in and enjoy a more productive and joyful life.